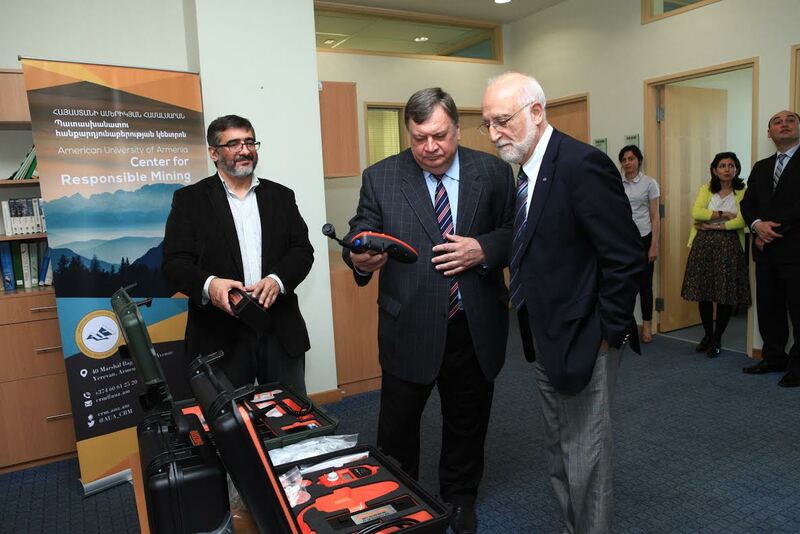 YEREVAN, Armenia — Head of the OSCE Office in Yerevan, Ambassador Andrey Sorokin, donated mobile toxic pollution testing equipment and supplies to the American University of Armenia (AUA) Center for Responsible Mining on May 21, 2015. The donated equipment and supplies are indispensable for collecting data that will inform affected citizens about health risks and allow for advice on how to manage them. Dr. Armen Der Kiureghian, AUA President, received the equipment, which includes a heavy metals soils analyser, photometers, water analysis instrument, additional kits for soil and water analysis. The equipment is part of a larger project – a crowdfunding campaign organized by ONEArmenia last year. The aim was to enable the AUA Center for Responsible Mining to conduct independent monitoring of communities for toxic heavy-metal pollution resulting from mining and mineral processing in Armenia. Within ONEArmenia’s campaign, “Let’s Protect Armenia from Toxic Pollution,” the AUA Center for Responsible Mining is expected to conduct targeted studies and community-wide assessments in five to eight communities over the coming year. The first studies are expected to start in June 2015.